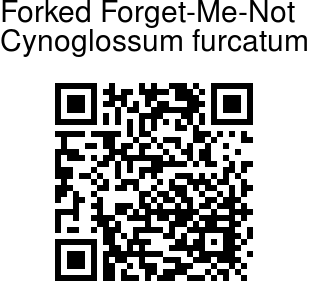 Forked Forget-Me-Not is an erect, annual or biennial herb, 40-80 cm tall. 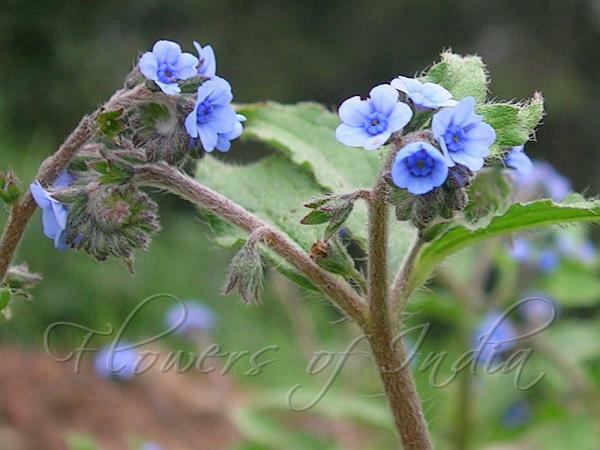 It has often been confused with the South-Indian plant Ceylon Forget-Me-Not. Flowers are funnel-shaped, sky blue, rarely white, 3-5 mm long; base 3.5-4.5 mm wide; limb 4-6 mm across; petals oblong, tip rounded. Style 0.52.5 mm long. Flowers are borne at branch-ends and in leaf-axils, in clusters which are forked, branches spreading at blunt angle, ebracteate. Flower-stalks are 1-2 mm long, shorter than calyx in fruit, densely bristly. Calyx is 1.5-2 mm long, slightly enlarged to about 3 mm in fruit; lobes ovate to ovate-oblong, densely bristly outside. Stems are single or several; densely and appressedly velvet-hairy, trichomes 0.4-0.8 mm long. Leaves are oblong-oval with pointed tip. Basal leaves are stalked, 2.5-15 cm x 1.2-4 cm, densely appressed-velvet-hairy. Upper leaves stalkless and smaller, moderately to densely appressed velvet-hairy. Trichomes short, rough, with multi-cellular base; 0.2-0.4 mm long, on veins denser, often longer and slightly spreading. Nutlets are ovoid, 2-3 mm x 1.5-2 mm, below concave; regularly glochidiate, below with few glochidia in the centre, denser at margins. Forked Forget-Me-Not is extremely widespread in Asia and is found in the Himalayas, Nepal, China, Bhutan, Vietnam, Thailand, and the Philippines. It is found mostly on disturbed sites and road sides at elevations of 960-3900 m.